In Richmond, VA! Available at Unbeatable Prices! Laminates can be found in a variety of species along with precision surface treatments that follow the décor grain. Richmond Decorating Center is your home for laminate flooring in Richmond, VA. View Our Incredible Selection of Laminate Flooring Brands! Laminate flooring gives you the look and feel of pricey hardwood, and even stone for a much more affordable price. Laminate was designed to reproduce the appearance of wood, stone, brick and ceramic utilizing highly detailed, digital photography of the original substance. At Richmond Decorating Center you can see one of the largest selections of laminate flooring in Richmond! The image uses advanced embossing technology that adds a realistic texture to the floor surface. A laminate floor can be used in virtually any room in your home. Laminate does have some sensitivity to excessive moisture so it would not be appropriate in a bathroom or outdoor use. Laminate is not a replacement for anything. It has developed its own unique character and secured its place in the flooring market. It possesses all its own features, stylings and performance benefits that are completely unique. In the Richmond laminate flooring market, Richmond Decorating Center is your one stop shop! If you’re into stone and tile, the same kind of embossing that goes into laminate wood decors is used to create fabulous ceramic and porcelain tile as well as stone installations in the popular 16- inch formats. Installing LaminateGiving a room or your home a whole new look with laminate is very easy, extremely fast and not messy at all. Laminate is usually “floated” over the subfloor. That means it’s not glued, nailed, taped or stapled. 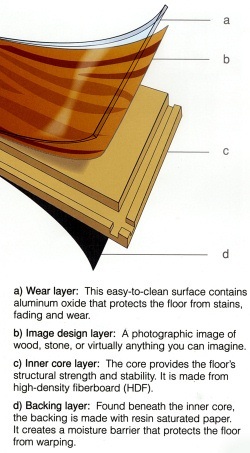 After leaving a small fraction of an inch around the perimeter of the room, laminate clicks together in place. It locks tightly with virtually no gaps between pieces. Your Richmond Decorating Center expert will work with you to insure a quality installation. Details like trim, transitions and moldings are best handled by your Richmond Decorating installation experts. With years of experience, they can provide a quality installation that will give you the look you expect. The most important feature of laminate (and one that you can’t see!) is the underlayment. This is a cushiony material that absorbs sound, helps to keep the floating floor in place and acts as a moisture barrier. The underlayment is purchased separately and put down like a carpet cushion. However, in some laminates, it comes pre-attached to each piece of laminate. Some new underlayments now feature antimicrobial properties which help prevent mold from growing should the back ever get wet. We advise you to consider purchasing the best you can afford to get the most features and benefits. Your expert at Richmond Decorating center can advise you on the appropriate underlayment for you. Come see why we are the leader for laminate flooring in Richmond!